ISO 9001 Quality Management System Certificate and ISO 14001 Environmental Management System Certificate have been handed over to the Ivanjica Municipality today, which made it one of the five local self-governments in Serbia that have introduced these standards, with financial support of the European Union and the Swiss Government through European Partnership with Municipalities Programme EU PROGRES. These standards will help the services for citizens to be faster, more efficient and of better quality, clearly defining duties and responsibilities of the Municipality staff, reducing administration costs and making the governance more transparent. 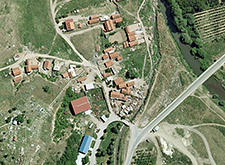 Detailed Regulation Plan for the Roma settlement Mala Guba in Prokuplje that was successfully produced with the funds from the European Union and the Government of Switzerland through the European Partnership with Municipalities Programme - EU PROGRES, received recognition at the 22nd International Urban Planner’s Exhibition in Niš. This document involving 5.75 hectares will contribute to creating conditions for development of infrastructure, regulating watercourse and defence from floods as well as address the issues of illegal construction and unresolved property and legal relations. The Deputy Manager of the European Partnership with Municipalities Programme - EU PROGRES, Marko Vujačić, has handed the certificates ISO 9001 for Quality Management System (QMS) and ISO 14001 for Environmental Management System to the head of municipal administration of Prokuplje Ivan Rakočević today. As of today, the residents of Crna Trava will be able to obtain rapid and quality services from the municipal administration in one place. With the opening of the Citizens’ Assistance Centre, the municipal Administration is now a genuine public service capable of fully meeting the needs of the citizens and businesses. 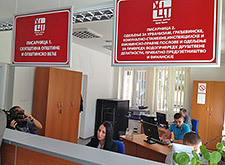 The Centre will verify documents, signatures and stamps, receive and register all submissions to the municipal administration, issue copies of birth, marriage, death and citizenship certificates andprovide professional assistance and other services that will significantly facilitate the citizens’ and companies’ resolution of their problems. The Citizens’ Assistance Centre was built in the Crna Trava municipal building with the financial support of the European Union and the Government of Switzerland through the European Partnership with Municipalities Programme EU PROGRES. The Crna Trava municipality contributed with 5,100 EUR to the construction and equipping of the Citizens Assistance Centre, which cost 42,100 EUR.